In addition to the Tom DeWeese “No Choice” DVD with the lecture from John Anthony that is being loaned out so groups may view, this video of what citizens of Rindge did to protect their town from federal decrees and laws is also very important. This entry was posted in Miscellaneous, Rindge on October 16, 2016 by GSF. Rindge residents have been at the forefront of fighting major urbanization master plans at their town meetings. In January and June of 2013, a Rindge resident attended two “visioning” sessions pertaining to a charrette that was held a couple of years earlier. He knew nothing of this charrette before these visioning sessions. Town officials had kept it a pretty good secret, although they insisted everyone was notified. What he learned was horrifying. They were planning on changing zoning in West Rindge Village, and the intersection of routes 119 and 202. What they were proposing was mixed use zoning in these areas. Small little shops on the bottom, and “stack ’em and pack ’em” living spaces on top. These very small “apartments” almost always end up being low income housing. Walking and bike paths. Traffic calming at the intersection. He and his friends did some digging at the town hall and found out the charrette was funded by a HUD grant. As time went on, they would learn just how dangerous this was. This is when he became involved. He started the group “Save Our Town” and started recruiting help by spreading the word. A newly formed committee started sending out flyers to every household in Rindge. Over 2,200 flyers were sent out alerting the residents on six different occasions. In October of 2013, these activists held an informational meeting with NH State Rep. John Burt and NH State Rep. Jack Flannigan which drew over 200 people. The residents were as surprised as the organizers were when they were told what the town was planning. Everyone knew now, with all the support, that they had to try and stop this. They canvassed neighborhoods with petitions and got the required amount of signatures to get three articles put on their town warrant for a vote. One article was to remove the charrette results from Rindge’s Master Plan. The second was to remove Rindge’s membership from the South West Reginal Planning Commission, and the last, and probably the most important, was to require voter approval to accept any HUD grants. All three passed at this town meeting by large margins. The removal of the charrette won by a vote of 1082-321. They also got one SOT member elected as selectman, and 2 for the Planning Board. They are happy to report as of now, it has been pretty quiet in Rindge pertaining to any more major changes. Save Our Town has a committee of about 12 members who take turns attending every Planning Board and Select Board meeting to make sure they do not try to sneak anything else by us. SOT is now a respected group in Rindge, and is often asked to attend certain meetings and hearings to make sure it is what the people of Rindge really want. SOT’s job is to make sure Rindge stays rural. This was a huge lesson that teaches us that you CAN fight city hall and win, you just need to get involved. This entry was posted in Rindge on April 9, 2016 by Admin. 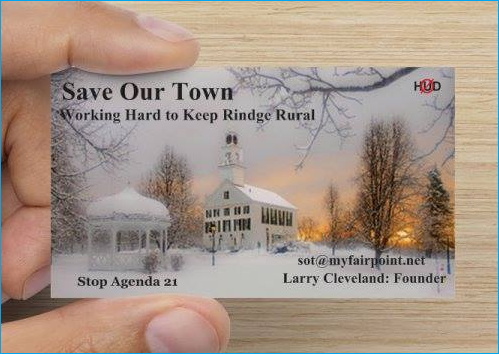 Tom DeWeese spoke to the Rindge-Jaffrey-Fitzwilliam Republican Committee about how the group “Save Our Town Rindge” fought back against HUD’s agenda promoted within the ‘master plan’ that had been recommended by the regional planning commission. This entry was posted in Miscellaneous, Rindge on July 18, 2015 by Admin. Come on out and learn about the American Policy Center. Tom is nationally known for his work fighting this “cancer” being pushed by the U.N. This entry was posted in Miscellaneous, Rindge on June 25, 2015 by Admin. This entry was posted in Rindge on March 15, 2015 by Admin. Tom DeWeese from the American Policy Center has been fighting regionalism forever. He recently featured our own Larry Cleveland from Rindge along with Hal Shurtleff, another warrior for property rights, on his webinar. We connected the two and the rest is history. This entry was posted in Rindge on December 11, 2014 by Admin. Larry Cleveland of Save Our Town Rindge had this to say about an article that appeared in the Ledger Transcript that blamed their group for voting to reject certain federal grants supporting local projects in Rindge, and to cut their relationship with the Southwest Region Planning Commission. In response to the article: High Speed Internet project at a standstill due to town vote (Karina Barriga Albring, June 18th). First of all, the title itself is misleading. The standstill is caused by the fact that the Fast Roads project in Rindge is complete. Please go to their website and see the press release. It has nothing to do with the “town vote”. They are out of grant money. Selectwoman Oeser keeps saying that the town can’t apply for any grants allowing for more broadband. To the best of my knowledge, there are no more grants available. If there were, don’t you think Fast Roads would be all over them? If there is, please Ms. Oeser, state what they are. I have been to several meetings, and not heard of one. Is this behavior just a tactic to discredit Save Our Town? The article alleges that Fast Roads brought high speed internet to the Police Department, RMS, and the library. At a recent meeting, the question was asked, “are there any Rindge town buildings connected to this broadband?” The answer was, “no, it’s too expensive.” The fact is this broadband “pipeline” only runs by 467 homes in Rindge. This is less than 25% of residences. Out of those, only 80 have chosen to be connected. This project cost the American taxpayer $2.5 million in Rindge alone. At that rate, with only 80 homes connected because of the high price to connect, and service rates, that amounts to over $31,000 per house. What a bargain. And now they want even more taxpayer dollars to run more lines that won’t be used? This article, like others, has again misquoted me. I never said that I believe there is no need to expand service in Rindge. I did say that I believe according to the Fast Roads press release, they have no intentions on expanding service in Rindge. Frankly, there are not enough houses per mile to make it a lucrative business for ISP’s. Another untruth in this article is the line “voters decided they didn’t want Rindge officials to receive any (HUD) grants.” Not true. We want to be able to see what they are, and what strings are attached before accepting. After this last round of HUD grants, it was revealed that town officials never read the whole contract, nor did they have legal counsel look at them. As far as “not having the tools” to apply for additional grants, I ask what grants? What tools? Oeser is stated as saying “getting geographic data from the SWRPC is the most convenient approach”. I say, it might be convenient, but there are other resources. It might take a little more work, but isn’t that your job as an elected official? Maybe the real convenience is blaming everything on Save Our Town. This entry was posted in Rindge on June 19, 2014 by Admin. The people of Rindge talk about how they were able to beat back Granite State Future. This entry was posted in Rindge on June 3, 2014 by Admin.